But he's pulled it away. Still 3-0 to the All Blacks after 14 minutes. Samoa have just turned over an All Blacks lineout. They are giving as good as they're getting in these early stages. There are some fierce tackles flying in from Samoa, but once again they are offside and the All Blacks have another penalty, this time on halfway. Actually it's just inside the half and Carter fancies another crack at goal. His kick hits the post and goes over. All Blacks lead 6-0 after 17 minutes. The All Blacks win yet another penalty, and again it's for being offside. They are putting themselves under real pressure here. Sky's App kicked me out just before the haka and I've been unable to get back in since. Useless! Thankfully I have these live updates to enjoy! 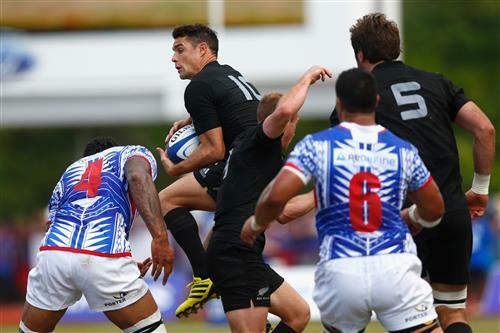 Three kick offs, three clearances from Ellis and the All Blacks have quickly won back the ball all three times. They're struggling a little for fluency in attack currently but, the more opportunities they get, that won't last for long. But now the All Blacks turn the ball over. Plenty of unforced errors from both teams early on. Now Samoa have a penalty. Whitelock left his feet during the maul. So, attacking chance for Samoa now. They win the lineout on the 22. Big chance here for Samoa to enjoy some ball at the right end of the field. The All Blacks' defence has yet to be seriously tested - is that about to change? ABs turn the ball over easily though and Ryan Crotty is able to clear as the ball trickles out over halfway. Samoa win a lineout on halfway and spread the ball wide to their pacey backs. Penalty coming for Samoa but they are playing advantage. Luke Romano has come off after suffering a gash to his face in a collision. The All Blacks will want to avoid injuries today but that one didn't look too serious. His replacement isn't too bad, either - world player of the year Brodie Retallick. Not anymore, the ref pulls play back for the penalty and it's in kicking range. What a kick! Tusi Pisi slots the penalty from halfway and Samoa cut the deficit to three points. Samoa turn the ball over on halfway and break down the blindside but Kieran Read was there to make a telling tackle, preventing a likely try. The ball dribbled loose and the ABs have a scrum. It's all a bit sloppy from the All Blacks. Loose passes and knockons and turnovers, but they have earned another penalty now in an attacking position. Andy Ellis lacking a little accuracy in his return to the All Blacks. It's not helping the All Blacks' fluidity but the halfback is hardly the only one to err when firing away a pass. Carter will kick for goal once again, this time from 40m out. And he's got it. The All Blacks are back out to a six-point lead. You always have to expect a little sloppiness in the first test of the season. And this year - with the unfamiliar conditions, a hard pitch and a host of top players missing - that has been exacerbated in the opening half hour. Oh dear. A clearing ABs kick has hit an official in the head. And the crowd bloody love it! The All Blacks swing the ball from side to side and create an overlap out wide right. But Samoa are blatantly offside again and the ref has no choice but to blow it up. Carter kicks for the corner. The All Blacks are after a try here. The All Blacks turn down a penalty in kicking range for the first time. They must sense this is an opportunity to put the foot on the throat. Look for them to drive the lineout. But the throw was not straight and they lost it forward. Double whammy. Samoa survive. Samoa have a scrum 5m out from their line now. It has collapsed and the All Blacks have another penalty. This time Carter will take the kick at goal. Interesting choice to take the points this time. The lineout drive will play a big part at the World Cup and the All Blacks would be wise to test it against a physical Samoan pack. They shaped to do so earlier but the throw wasn't straight - on this occasion they're happy with three. The kick is good. Carter gets his fourth kick and the All Blacks now lead 12-3. Samoa's kick off is a poor one and flies out on the full. The All Blacks will restart with a scrum on halfway, a good attacking opportunity. 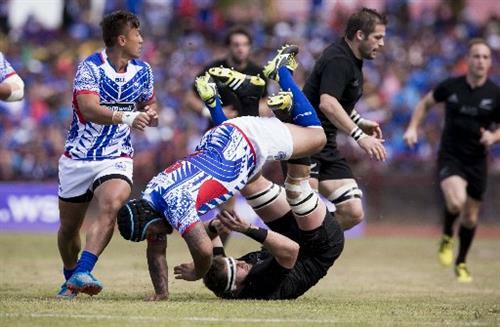 The ABs struggle to break the Samoan line from the scrum and eventually concede a penalty. 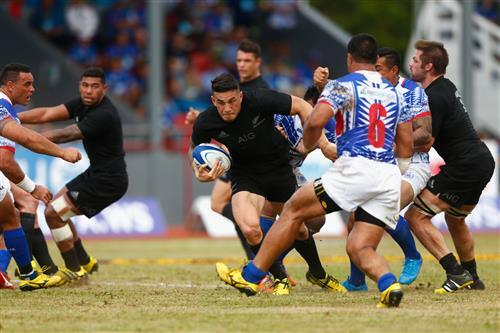 But Samoa have, once again, failed to find touch with the penalty. An awful lot of whistle in the first half. All the stoppages and errors have hardly made for a thrilling opening - there's been much more of a spectacle off the field. Just three minutes to go in the first half.